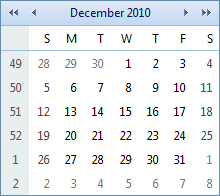 The following tutorial demonstrates how you can create custom RadCalendar skin, using the Office2007 skin as base. The tutorial only changes skin CSS classes that affect the RadCalendar control. Drag a RadCalendar control from the toolbox onto a new AJAX-enabled application Web Form. 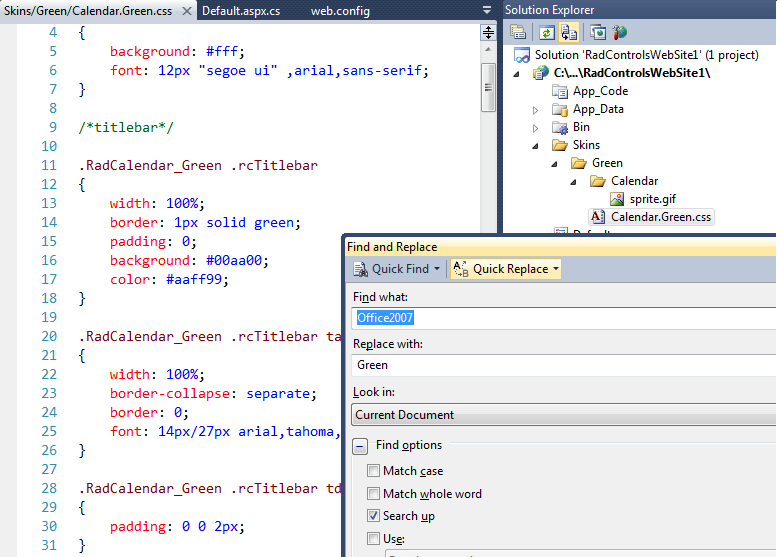 In the Solution Explorer, create new "Skins" folder in your project and then add a "Green" folder inside. 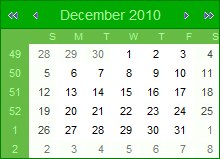 In Solution Explorer, rename "Calendar.Office2007.css" to "Calendar.Green.css". Solution Explorer should now look something like the following: You do not need the Office2007.gif file - this is a preview of the original Office2007 skin, so you can safely delete it. Change the Skin property of your RadCalendar control to Green. Set the EnableEmbeddedSkins property of your RadCalendar control to false. Locate the selector .RadCalendar_Green .rcRow .rcHover. The .rcHover class is applied to cells in the day matrix when the mouse hovers over them. Change the background color and border-color to #eeffee. In case you wonder why the border color is the same as the background color - this is the easiest way to make the border invisible. If we simply remove the border, RadCalendar will start flickering on mouse over, because the date cells have a white border by default. We can remove that also, but the skin modification will become more complex and this is out of the scope of this tutorial. Locate the selector .RadCalendar_Green .rcRow .rcHover a. This provides a different color to the hovered dates. Remove this rule. You may want to make changes to the base stylesheet of the RadCalendar control, which holds the rules that are common for all skins. 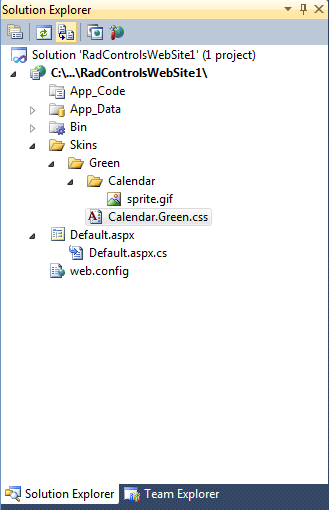 In order to do so, you need to copy the Calendar.css file from the Skins folder in your installation directory to the Skins folder in your project. Then, you should register it in the head tag and modify it to meet your requirements. Note that, to see the changes, you need to set the EnableEmbeddedBaseStylesheet property of RadCalendar to false .